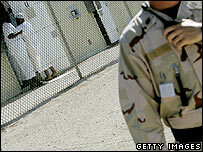 The US has rejected the UK government's calls for closing down the Guantanamo Bay prison camp for terror suspects. US officials said the camp housed dangerous people who could pose a fresh threat if they were released. The UK Attorney General Lord Goldsmith said on Wednesday the camp's existence was "unacceptable" and tarnished the US traditions of liberty and justice. The criticism shows a significant shift in the UK's stance on the camp run by its US ally, our correspondent says. UK Prime Minister Tony Blair has, in the past, called the prison camp at the US base in Guantanamo Bay, Cuba, an "anomaly". But in the strongest criticism yet from a UK government minister, Lord Goldsmith said the camp had become a symbol of injustice. "The historic tradition of the United States as a beacon of freedom, liberty and of justice deserves the removal of this symbol," he said. Lord Goldsmith is said to have serious doubts over whether the indefinite detention of "enemy combatants" is legal or fair. Responding to the criticism, State Department spokesman Sean McCormack said the US "would like nothing better" than to close Guantanamo down at some point in the future. Echoing the words of US President George W Bush - who in a TV interview on Sunday said he would like to "end" the detention centre - he said: "Nobody wants to be a jailer for the world." "But the fact of the matter is that the people there are dangerous people," Mr McCormack said. A Pentagon spokesman said: "The dangerous detainees at Guantanamo include terrorist trainers, bomb makers and would-be suicide bombers, many who have vowed to return to the fight." Lord Goldsmith told the London-based Royal United Services Institute there was a case for limiting some rights for collective security. 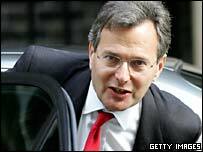 Lord Goldsmith also defended the creation in the UK of new criminal offences in the Terrorism Act 2006 to counter "some features of al-Qaeda type terrorism which distinguish it from other forms of crime".